West Ham 1 vs Swansea 4. The day started in the airport bar (as usual) where I met up with Liam, Boston Jerry and Grahame with his daughter. After a couple of pints the flight was called and we walked across the rain lashed tarmac and boarded the 8.20 to Stanstead. The flight was uneventful, the best part being it wasn’t that busy and I managed to get 3 seats to myself! Once at Stanstead the weather could not have been more different, not a cloud in the sky and hot! We met up with James and jumped on the bus to Stratford. The bus made good time and soon we were sitting in “Stratford’s Best Cafe” wolfing down large breakfasts. 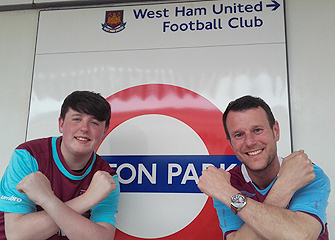 There were a few other hammers in, the girl asked us “why is everyone wearing the same colours?”, we answered that we were “heading off to watch the football”, “football” she answered quizzically and headed off. We all looked at each other and laughed, boy is she in for a surprise next August! Next stop, the Golden Grove and with pints in hand we headed out the back to the beer garden. Was it hot or what! We sat in the sunshine and discussed the coming game. 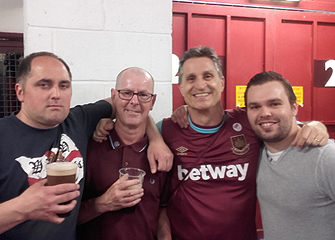 Liam introduced us to a group of lads over from Germany, the Sauerland Hammers, one of whom, Rene, I had met before at the Dublin Hammers Christmas Party and at the Sunderland game. We were also joined by Charlie and his son Aaron. 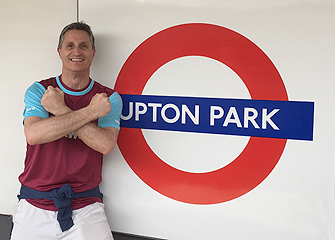 After a very pleasant couple of hours we jumped on the tube, which was more like a suana and melted our way to Upton Park. Green Street in the sunshine was perfect for photo taking and we didn’t hold back. After a visit to the club shop, badge seller etc. we made our way into the ground. Because of the ballot we were all sitting in different areas of the ground, I was in the BML with the owner, James in the Betway and Jerry in the BMU. 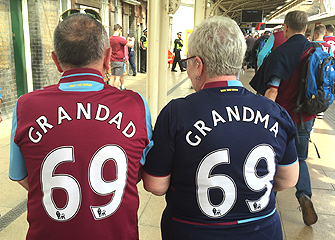 West Ham started brightly and in the first 15 minutes or so had four good chances. The atmosphere was rocking, being the last Saturday 3pm kick-off ever, we were all “up for it” lots of singing including all the old favourites. When Swansea opened the scoring it didn’t dampen things down at all, when they got the second, which was a cracker of a goal, we carried on, ah we’ve been here before this season, not to worry and the singing carried on. 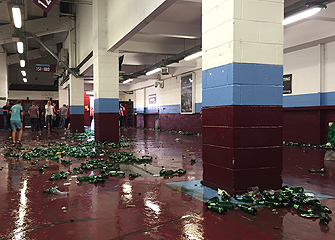 Half-time came… 2-0 down! I headed down to the concourse. Someone started the “Big Fat Frank” song, everyone joined in and a big party started! 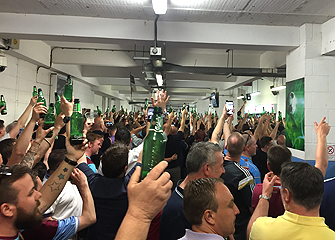 Another memorable moment was the “Beers up if you love West Ham”, the atmosphere down there was so good I was late getting up for the second half. I should have stayed down there as before long we were 3 down! At this point Bilic took Moses off (thankfully, he had been awful), Sakho joined Carroll in attack, but to come back from 3 down was a big ask. It just wasn’t our day, with Antonio (my man of the match) attacking down the right and Sakho causing problems we made 3 or 4 chances which were saved, deflected and so on. We eventually scored when Sakhos effort was deflected in, it went down as an own goal. Then they scored again! 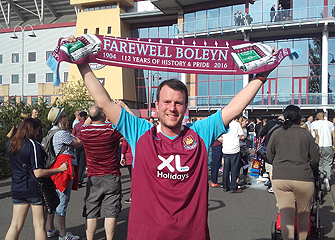 Oh well… disappointing, but at this stage of our momentous season, for me, it was all about being at Upton Park. We braved the queue to the tube station, thankfully they had put the air conditioning on and the tube wasn’t the uncomfortable experience it had been earlier! Back at the Golden Grove we just had time for a couple before jumping on the national express to Stanstead. More pints at the airport. While we were queuing to board we got talking to an american couple, him in a Swansea shirt? “Gee the Swansea fans are great singers” and “it’s not like that back in the states” were the comments after, for them, an eye opening afternoon at english football. Back in Dublin the rain was still lashing down as we ran to the terminal. Luckily I didn’t have long to wait for a bus. 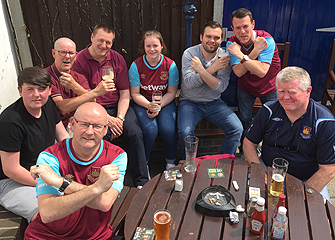 Great day, great weather, great to be at Upton Park in the sunshine… crap result!